Beacon Hill Quarry before clearance. 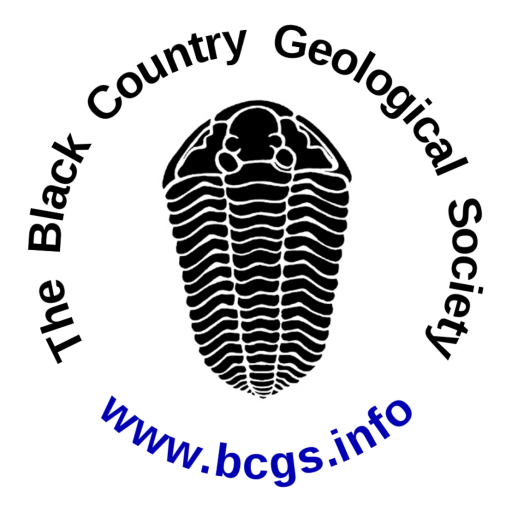 It was a cold, sunny and very windy start when 10 BCGS members met at the main entrance to Beacon Hill, Sedgley at 10.00. Our leader was Gabriel Mason-Dixon from the Birmingham & Black Country Wildlife Trust. He provided access and ran through some information about the site, and health and safety business. Beacon Hill forms the northern end of a ridge, known as the Sedgley-Northfield Ridge, which forms a natural watershed for Central England. Rainfall to the north and east drains towards the River Trent and out to the North Sea, whilst rainfall to the west and south drains towards the River Severn and out of the Bristol Channel. The Hill is formed of a folded unit of Silurian Aymestry Limestone (part of the Ludlow Series) which is approximately 10 Ma younger than the Wenlock Series rocks seen at Wren’s Nest. The rocks are grey-brown in colour, thinly bedded and nodular with occasional bands of bentonite and muddy horizons. The limestone is also fossiliferous and contains many brachiopods and bivalves. This strata makes the site an important one for limestone grassland. It supports a variety of plants, including greater knapweed, carline thistle and bristly ox-tongue, whilst attracting rare butterflies like the brown and green hairstreak. 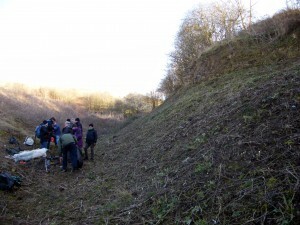 Beacon Hill Quarry after clearance. Like Wren’s Nest, the site has been heavily quarried for purer limestone in the past, which has left behind an undulating landscape. From the top of the hill a marvellous panorama can be viewed of the Shropshire Hills, Birmingham, and across the Black Country, all representing a feast of varied Palaeozoic strata. Our day was spent clearing saplings and bramble from one of the many hollows on the hill, where a good exposure of the Aymestry Limestone could be viewed. Some clearance had clearly been undertaken before, but some time ago. Gabriel pointed out that although Sedgley Beacon is owned by Dudley Council there are not the funds or personnel to keep someone on the site looking after it all the time. Therefore, the most the Council can do is to maintain access to the site and deal with any complaints. 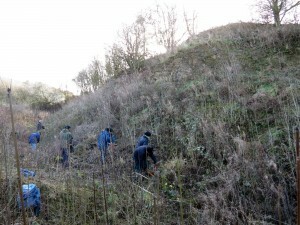 The BBC Wildlife Trust acts on behalf of the Council to maintain the site and is grateful for any voluntary help they receive.